Mixing up drinks, like cooking, requires you to taste the final product and make tweaks according to your preference for sweetness or tartness or sourness. When I started playing around with the Barker’s New Zealand cordials I was thinking less about exact measurements and more about proportions of ingredients. This makes sense since not everybody will serve their drinks in the exact same size glasses as I use. When you read the “recipes” below see them more as a guide to creating delicious refreshing drinks for your next dinner party or weekend gathering. 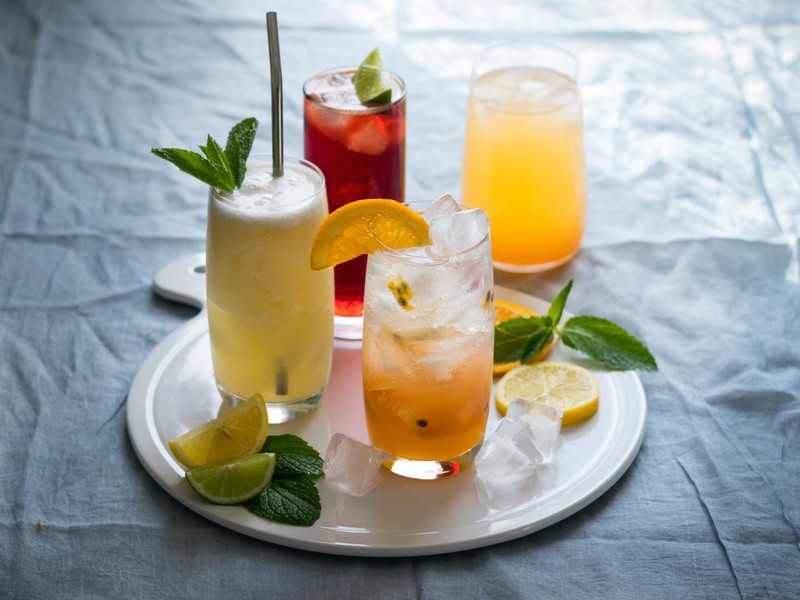 Mocktail recipes were created for the Barker’s Pantry website. Fill the glass with ice first and then add the Barker’s New Zealand Orange, Passion fruit and Barley Cordial followed by the guava nectar. Top with the soda water till you almost reach the top. Spoon a generous teaspoon or two of passion fruit pulp into the glass and garnish with a slice of orange. Assembling the drink like this gives it a lovely layered look but if you don’t want your guests to have to mix their own drinks, give it a good stir before serving. In a small food processor or blender, blitz together the Barker’s New Zealand Lemon with Lime, Cucumber and Mint Cordial, pineapple pieces and coconut water till you get a slushy like consistency. To serve, fill the glasses with ice and then pour the slushy over the ice, leaving a half centimeter gap below the rim. Spoon coconut milk over the top and add a sprig of mint for garnish. Fill the glass with ice first and then add Barker’s New Zealand Blackcurrant Cordial. Top with ginger ale. Take the wedge of lime and squeeze the juice into the drink before placing the lime into the glass as well for garnish. This post was sponsored by Barker’s New Zealand. All opinions are my own.